The NEW redesigned for 2015 SEASOFT FREE™ Diving Vest was developed to liberate you from wearing a weight belt while “free diving". The FREE holds up to 40 lbs. of weight, fits divers who weigh 100 to 280 lb. and will fit a smaller or larger diver with the optional cummerbunds. 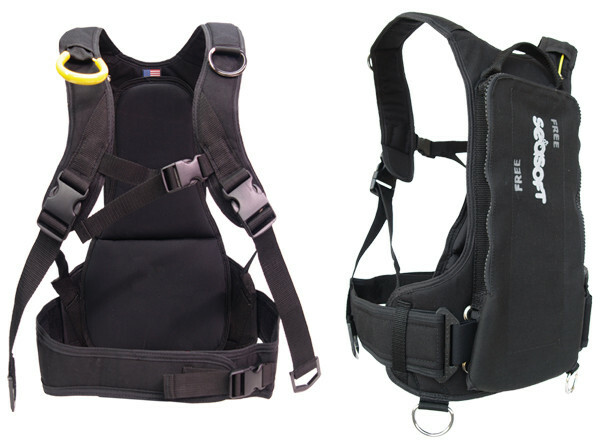 Be FREE of a weight belt while free diving, get the SEASOFT FREE™ Diving Vest. At low tide you have an uneven bottom that could be over your head, there are kelp forests that could entangle you, and there are rogue waves that can sweep you into water over your head. It is just not worth it. A few abalone are not worth dying for! SEASOFT SCUBA will not knowingly sell any diving products to a "rock-picker". Free diving with fins for abalone can be a fun and challenging sport, why not learn this sport from a local expert instructor? The SEASOFT FREE™ Diving Vest was developed to liberate you from a weight belt while “free diving”. The NEW, redesigned for 2015 SEASOFT FREE™ holds up to 40 lbs. of weight in the weight compartment located in the back of the FREE. A moveable inner dam keeps the weights from moving or shifting around and with the thick lumbar support, the comfort is incredible. There are 2 D-rings on the waist and on the upper left side for attaching accessories and a float or surface line. In an emergency, completely pull out the Yellow Ripcord, located on the right shoulder, by pulling the Ripcord down and back toward the back to ditch the weights out of the bottom of the weight compartment. The newly redesigned waist strap redistributes the weight around your hips and makes your weight load feel even lighter. If you want to be free from discomfort, sore hips and you want to almost forget you are wearing weights, the SEASOFT FREE™ is for you.